IHeart Organizing: IHeart: Organizables and a GIVEAWAY! 253 IHeart: Organizables and a GIVEAWAY! This week's giveaway is sponsored by Organizables! Organizables is a practical solution to the early morning chaotic demands of getting children ready for school every day. For the busy parent who has to get kids up, dressed and fed on a tight schedule, Organizables are the antidote to your morning frustrations. 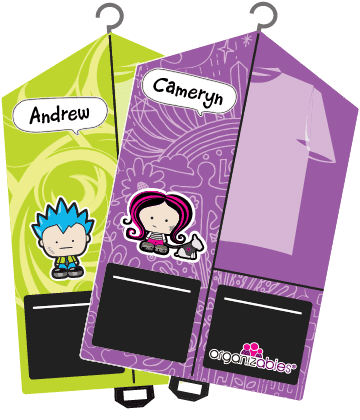 Organizables clothes organizers feature colors and designs that are visually appealing to kids and are easy enough for even very young children to use. At the beginning of the week, your child chooses the clothes that he or she will wear for the next five days - putting an end to weekday morning arguments over wardrobe! With Organizables, you can eliminate the extra step of putting 5 days of clothing selections in drawers and closets. Clothes stay neat, clean and wrinkle free! 5 days of the week hanging organizable bags keep daily outifts, including clothing and accessories, neatly organized and in one place! With 5 clothing bags labeled Monday through Friday and two pockets for socks and accessories, your kids will be motivated to keep their room tidy while streamlining your morning routine. Organizables weekend and activity organizers are designed to put the fun back in preparing for events such as a getaway to Grandma and Grandpa's house or to keep uniforms for sports and other activities in one place! These clothing organizers are made with long-lasting, non-toxic materials and come with a one year warranty! Giveaway is open from Tuesday, December 13th through 9:00 p.m. central time, Monday, December 19th, and the winner will be announced right here on Tuesday, December 20th. One winner will be selected using random.org. 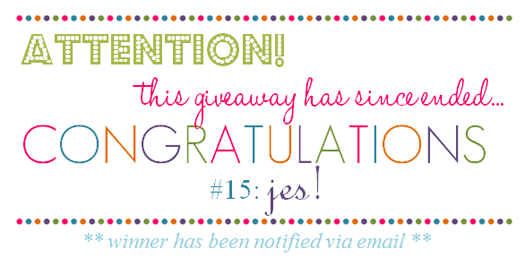 Please ensure I have your blog or email address so I have a way to contact you if you win. Check out the Organizables website and leave a comment here letting me know how Organizables would help make your life easier. "Like" Organizables on Facebook and leave a comment here letting me know that you did. Enter "iheart" at checkout and you will receive a $5 off discount on any order! These would make mornings so much less stressful around my house. No more arguments! Thanks for the chance to win! They would allow my 6 year old to get herself dressed in the morning while I still have a little control over what she wears. This would definitely make it easier for my husband to dress our little girl the mornings that I am gone. What a great giveaway! I could definitly use these for my daughter who will be starting kindergarten soon. Oh, and I follow on Facebook. Thanks! This would save me oodles of time in not rummaging through drawers trying to get my daughter ready for the babysitter. Awesome! And I liked them on facebook as well! I "Like" Organizables on FB! Thanks for the chance to win! This would help my husband out so much to have my daughters clothes organized. It is also great for travel. My husband gets our daughter ready in the morning and this would save him time and less arguing over outfit selection! I tried using cubbies for this same concept but this sure would be a lot simpler and more space-efficient! My hubby gets our daughter ready and sometimes the outfits don't coordinate...I buy outfits together to eliminate that problem but it doesn't work unless I'm dressing her! This would help me continue being a clothes freak. :) Matchy, matchy! This would save me time in the mornings (we are currently using the canvas shoe organizer that is hung in the closet ... this would be perfect because clothes would be "hidden" and just pick one out (and we wouldn't have to worry about her 5 1/2 mo old puppy stealing her clothes! This would be so nice because my daughter wouldn't have to fight me every morning on what she will wear - we will pick them out together at the beginning of the week! OMG!! These would make life with my 7 year old SO much easier in the morning! He always has an opinion on what to wear and it is such a process! That website is awesome!! My daughter wouldn't have to search for clothes every morning (in the bottom of her closet because she didn't hang them up the last time she searched). How nice would that be? I plan on having a family in the near future and these would make dressing our little bundle of joy so much easier. Anything that streamlines our morning routines would be a big help! These would give my "fashionista" 5-year old the choice of what to wear each week!!! Thanks for the giveaway! My daughter is too exhausted at night to pick out clothes and oh so cranky in the morning, so it would be awesome to get it all figured out on the weekend!! Plus, it would be great to know that the clothes she wants aren't at the bottom of the laundry basket! My 2 year old loves to pick out her clothes, this would helps if we did it in advance, love this! I "like" organizables on facebook! I "like" Organizables on FB! Oh my word!! We are in the process of adopting a sibling set of 4 from foster care, 2 boys & 2 girls! I am sooooooooo going to have to have these! I like organizables on fb! This would make my life so much easier in the morning! I need 2 sets, one for each girl! I love that it includes a spot for socks and accessories! This would help make our mornings so much easier! I have three boys so I would love the deluxe boy set! Thanks. Wow, to eliminate the arguing each morning over what to wear? Wahoo! My kids wear uniforms this year, but next year these would make mornings sooo much more manageable!! This would cut down the chaos of getting 5 kids ready! Just love love love it. I would use Organizables in the future for when my daughter goes to school! I'm a firm believer in picking out your clothes the night before or on Sundays for the upcoming week!! It's something my mom instilled in me and it's something I plan to instill in my kiddos! I "liked" Organizables on Facebook!! Pretty amazing! I checked out their site. My daughter is a first grader who has a little trouble getting up and going in the mornings. These handy organizers would streamline our mornings (and make it fun at the same time). I love that they have extra pockets for accesories and hairclips. PERFECT! I liked organizables on FB !! This will take the guess work out of what outfit to wear. I checked out the website. This would make life so easy! They should make these for the adults too. I liked them on facebook. These would be perfect for my little sister. She is ten but She loves to plan out her clothes ahead of time for school. This year my dad told her to lay out her clothes for the first week of school. She thought it would be a good idea to write which day she was wearing what shirt. This would be a great idea except she wrote on them and the shirts were tagless. She used a sharpie. Let's just say this would help out my parents budget. Also my sister would like the planning of it. Win! Win! our morning routine would definitely be better streamlined if we put everything together on Sunday. As a mom of 4 little ones ( 9, 8, 4, and 3)....this would make my morning routine SO much easier!! Especially now that the older two can dress themselves. Everything would be in a bag, ironed and ready to go!! LOVE this idea! It would help making the morning less stressful & to run more smoothly. I think my son would love this! This organizer would help him to be more independent in getting dressed for school and such! What a cute giveaway! Wow! I have never seen these before. They look really neat! This would help me out so much. I would have to hear "what do I need to wear?" I went and liked them on fb! I will no longer have to run around a figure out what will be worn each day! My 6 year old daughter would LOVE these! She likes to get her clothes ready the night before, but we don't have any good plaqce to place them. This would make our mornings so much easier. I think I'm incapable of matching until after a few cups of coffee. It's only then (usually around 10:00am) that I realize my son is dressed like a refugee! This system would save us both a lot of embarrassment! lol. 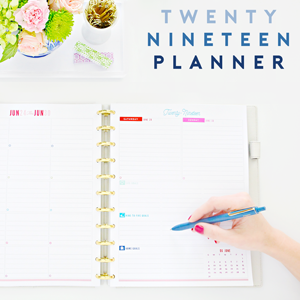 These will make planning for the week so much easier! I also 'liked' organizables on facebook. User name on FB is Gin Ia. These are amazing and would make anyone's life easier! Thanks for the giveaway! Wished I had thought of these! I love that they come with pockets for socks and accessories! My daughter spends lots of time in the morning trying to decide on just the right accessories. What a lifesaver these would be! my 10 yr old daughter is terrible when it comes to choosing clothes in the morning, and I have to admit her several wardrobe changes "so she can match" often have me arriving late at work :) This would be a great way to get her matching outfits ready on a Sunday night, when we have plenty of time to discuss her weekly fashion show without me being worried I am going to be late for work! Well, let me tell you how it would make my life easier... I have an 11 year old who doesn't know what dirty clothes is or when to tell me she doesn't have anything clean or just starts wearing dirty clothes! This way laundry is done and she puts them up on the hangars and no more worries until the weekend rolls around!!! Why didn't I think of that!?? I liked it on facebook too, maybe my friends will get some too!! This would totally help on trips because my husband can never get the outfits right! Love it for school too. I love the pockets for socks, etc! It would make our morning routine so much faster! These would be great for my 5 year old son. No more striped shirt with plaid shorts!! I liked organizables of FB. Nice to see that they are a local company. It woiudl be perfect for our two sons pile of clothes! I've been searching for a way to get them more organized! What an ingenious idea! I went to the website AND liked them! These would help get me little girl excited to get dressed in the mornings before school. These are great! Hope to win a set! Since I have a hard time being organized at times these bags would help me out tremendously in having my boys ready for the week. Those are TOTALLY FUN! I liked them on facebook! I think my daughter would love these! The girls ones on the site are my fave! Oh my goodness, these are so cute! This would make getting ready in the mornings so much easier! I like them on facebook! Hope I win! These would make my life so much easier with my 4yo who insists on creating her own outfits, even after we have discussed the outfit the night before...what a way to eliminate my headache in the AM!! Thanks for the chance to win. This would be a fun gift for my sister (nephew)! This would benefit my Mom more than anything- with 5 kids in 4th grade and below, mornings can be super hectic! 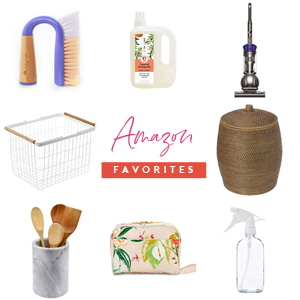 I "liked" Organizeables on Facebook! This would make the day to day routine go much smoother! I don't know why but mornings are so hectic at our house, and if my girls could go in and just unzip the bag for the clothes they were going to wear that day, things would go so much better and they would still feel independent! I liked Organizables on FB. This would be awesome for my little boy! Thanks for an exciting giveaway! 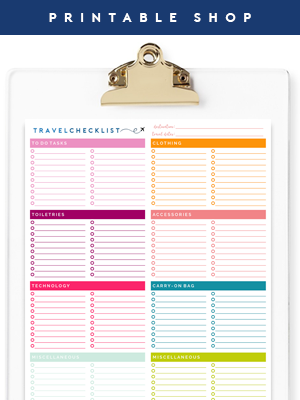 I checked out organizables - and I LOVE them! Wow! What a great idea for kids! My girls (3.5 & 5) are constantly pulling clothes out of drawers to find something to wear - and they NEVER put the clothes back. This is a great idea that I'm sure would help them out. My 5yo loves to be organized and it drives her crazy when her sister leaves clothes everywhere. I have a kindergartener and a 3rd grader, and these would make our school mornings SO much easier! What a cool idea! Definitely checking out the website. Great website. My 8 year old son Connor would love the five day set. He is getting his own room soon and this would be awesome to keep him organized. I'm excited for no more last minute scrambling to find an outfit! This would be great for my 6 year old. Although he does a decent job picking out his clothes but being able to organize and set up what he will wear during the week would be great. They would also be great for his extra activity uniforms (scouts and Taekwondo). OH Please Please let me win these! My lovely cousin needs these for her kids! She is a hard working nurse and her biggest issue of the day is having to get her two little ones up and dressed for school in the morring trying to find a sock or missing shirt is a big problem so, i hope i win so i can give her these for a gift! As a single mom, who has almost no storage space for her son, this would make things SO much easier! I'm in the process of building him a closet (our one bedroom apartment had a nook that was used as office space before... it's slowly turning into a bedroom) and it would be great to be able to neatly hang his clothes in a way that would help us all during the week! I love the idea of having a place to put the sports uniforms everything is together so we can grab and go! I liked them on FB, I would love to be able to stop the feuding in the morning with my daughter and have a peaceful morning!! This would help our hectic mornings. We are the family that scrambles for clothes. I like Organizables on facebook. This would help my daughter be more responsible in getting dressed while I get the baby ready in the morning. This would make it so much easier on my hubby when he's getting the boys ready for the day! I struggle with laundry and clothing more than ANYTHING in my home. Being able to just put things right in the bags and have the week DONE in one fail swoop would help streamline my clothing disaster tremendously. This would be wonderful for both my kids and save everyone from the 'what to wear' drama! Cool giveaway. Would love to win this for my son. Great product idea. This would save a lot of time and frustration at our home. How would it help... who would not want this. Not having to worry about what everyone wears through out the week is brilliant. You could do it all on laundry day and forget about it! I love the colours too. I think If I won, I would have to get anything but the pink though! It would prompt me to get more organized in other aspects of my life, and I could use the extra 15 minutes of sleep! :) I liked Organizedable on Facebook and my email is: siempremirabella@yahoo.com! Awesome giveaway! I would love that and it would help me get organized in the morning!!!! I liked it on facebook!! I want the pink ones! This would be wonderful for my friend who has two young daughters in school and they are always trying to figure out what to wear before school starts. These are brilliant! Wish they were around when my son was smaller. No more worrying in the morning of what to wear. Having seven kids in the house and as of next Fall, all seven going to school, the Organizables would be guaranteed to be the most used & most cherished item in my house! I know that only one is being given away but I can promise you that I will be buying some more for the rest of the kids. :o) I most definitely liked Organizables on Facebook and went to their website & linked it to my Favorites Bar! I love that we would cut down the amount of time ti takes us to get ready for school! I would love to win the girls weekday set for my beautiful niece :)...I know she would love to put her school uniforms in the organizers. I think this could make the mornings easier because it makes picking out clothes more fun. And who doesn't need more fun? Love these organizers - I have three kiddos, none of whom can pick out there own clothes. Of course, when I work, my husband lets them choose whatever they want. I have shown up to pick my kids up from Wednesday night church and they are wearing the most ridiculous outfits! Anyway, these would be a great addition to our house for sure! My niece is just like me and LOVE to be organized. She would love these. I went to the website and I really LOVE the extra bag for sports. I know it would make her life and my sister's life a whole lot easier. I liked them on Facebook. My little girl starts Pre-School in January and this would be prefect to help her learn how to get herself ready for school. It would be a great learning tool and she'd get so excited! How awesome are these! My husband gets our kids ready in the morning and this sure would help!! Checked out the website and would love a set for the weekday girl. I would love the standard weekday boy set! These are awesome! These are AWESOME! MY oldest gets her clothes ready the night before and puts them in a bin, but I feel like she rushes and throws anything in there since she always ends up doing it the night before. This would be perfect for her so that she has one less thing to worry about every night or morning! I would use Organizables to limit the number of daily costume changes my 3yo does, and also to help me whittle down both of my girls' wardrobes. I love this idea! So much easier to let your little one feel independent, but without having mismatched clothes and a messy pile of rejected outfits. I would love the Standard Pink set! So cute! I LIKED them on Facebook! Yay! I'm a weekend laundry person, so I like that everything can be picked out in advance. On their website, I liked the weekend sets too. It would be convenient to have those clothes separate, especially if there was a certain outfit needed for a particular occasion. My 8 year old and I argue every morning about what to wear! This would be so awesome to take the thinking out of it!! I hope I win!! organizables would be great for my 7 year old daughter. it would make our mornings so much smoother and it will help her be more self sufficiant! i liked organizables on facebook too! What a genius idea! I think I may even need them for myself! 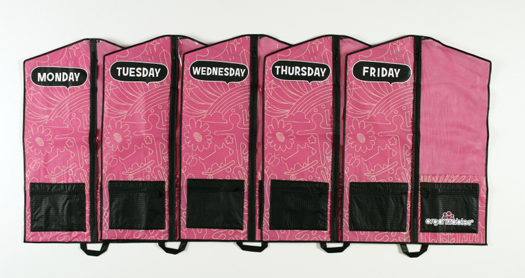 I'd choose the Standard Pink Weekday Clothes Organizer since picking out clothes in the morning is particularly hard for my daughter! I liked them on Facebook. OMG!! My daughter and me could use a set! My kids thrive on organization, so of course these would be well received! I need 2 sets, so to win one would be really helpful! These would be especially helpful for my daughter, who loves to accessorize... keeping all of her jewels and bling in the pockets would keep them off of the floor every morning! *I liked on fb too! 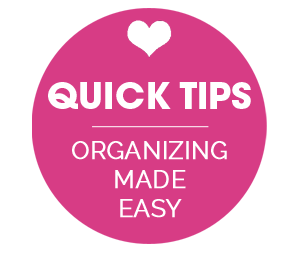 I love your blog and organizing tips... kateewestover[at]gmail[dot]com. My daughter could use some help in the organizing department! These would be amazing!!! I liked organizables on Facebook. 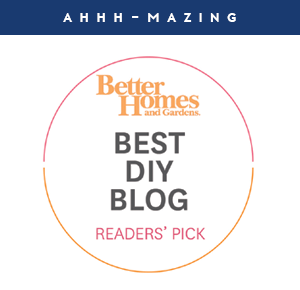 & I just wanted to say, I just found your blog...and LOVE it...I'm instantly addicted! Organizationals would make my life easier with my 4 year old. He is ALWAYS wanting to pick out his own clothes, however he is NOT neat about it...ugh. Organizing always rewards me by giving me more time to do other things. I liked Organizables on FB under my Sally Daffodil name. 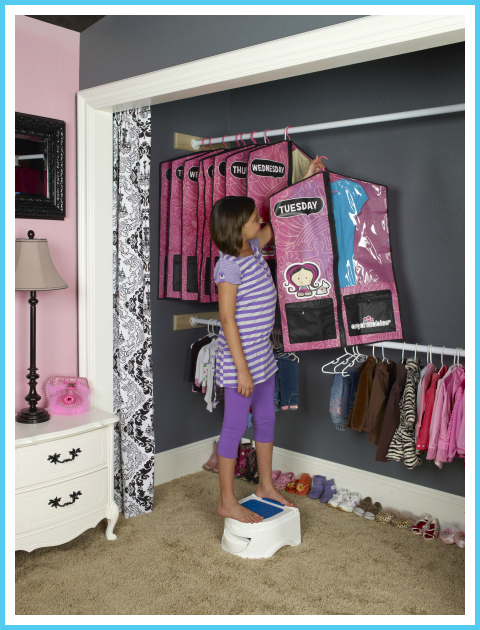 I like the Deluxe Girls Weekday Character Clothes Organizer. I think our oldest would love being able to go and get her clothes (without help) and be more a part of things. Great giveaway. I would get the weekend/activity set for boys! I have been trying to get my kids started on the habit of setting their clothes out the night before. These would give them the perfect place to do that! I liked Organizables on Facebook. Weekday mornings are so rushed and the Organizables would be a fun way to plan my daughter's school outfits ahead of time. Even though my daughter wears a uniform to school, her outfits vary- pants, skirts, dresses and tights, leggings, socks and of course short or long sleeved polos, button up shirts or vests. And thats not even accessories! :D Organizables will help us utilize our time better by getting her outfits together and in one place and minimize time wasted so we can get to where we need to be on time and with little to no fuss! It'll also be a fun way to teach her how to be organized and give me peace of mind. I like Organizables on fb. Oh these would make my life soooo much easy, I can stop the every day battle over the spiderman costume I would love to win!! I "liked" them on FB. I don't have a school-aged child yet, but this will still help me out. Thanks! Seriously?!?!? Anything that can get the 3 kiddos out the door faster in the mornings is a huge win in my book!!! Organizables would totally change my mornings - making life with my son so much better not having to deal with the clothing issue!